The Hazard Perception Test (HPT) can be taken online at any time. You should choose a time that’s convenient for you that doesn't clash with school or work commitments, as you want to be able to focus on the test. A good time to take the test is on a Saturday. You won’t have to worry about school or work and can take time to prepare without distraction. If you fail, you can then re-attempt on Sunday, without distraction, while the HPT is still fresh in your mind. It’s important to stay hydrated, and make sure you eat before the test. Although not physically taxing, tests are often mentally draining and you want to be at your best to ensure you pass on the first go. Make sure you’re aware of the test and licence fees you will have to pay. These administrative details can be found on the Department of Transport and Main Roads website. When using the practice tests you would have been using a cursor and button below the video to indicate an action. It is important to note that there will not be a button to indicate an action - you will have to click on the other road user involved in the traffic hazard as soon as you recognise it. A yellow circle will appear to indicate your click has been recorded when you click on this road user. Your click is timed and your reaction time is used to determine whether you pass the HPT. As such, you will want to react quickly when you believe the relevant action should be taken. This will require you to have your mouse cursor ready to click on the video as necessary. However, you want to cover as little of the video as possible to ensure you can still accurately assess the footage and react appropriately. As such, it is recommended that you position your cursor within the video frame, but not in a place that could cover a potential hazard (e.g. the bottom left or right corner of the video area). This will allow you to react quickly when necessary and take in the complete scene. Remember that you are not being asked trick questions. If an action is required it will be obvious. Remain calm, alert and don't be afraid to act. Your years of driving experience and the practice tests here have prepared you well for this test, so react when necessary and do it quickly, just as you would in a real life traffic situation. 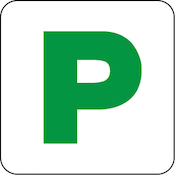 For comprehensive information on the provisional P2 licence and Hazard Perception Test, please refer to the Department of Transport and Main Roads website. The above information is a summary of this content and although current when published may now be outdated. To ensure you are accessing the most current and accurate information, use the Department of Transport and Main Roads website or visit your nearest Transport and Motoring Service Centre.